Morocco is bordered by the Mediterranean Sea and corresponds to the last step in Africa before reaching Europe. Within Morocco, two towns – Ceuta and Melilla – already are Europe, which results in a daily attempt by immigrants to enter their perimeter. Ceuta is surrounded by the sea and by a grid of barbed wire. If before this barrier was three meters large, now – to hinder entry into the geopolitical space of the European Union – it is six. The first sight of the grid is absolutely brutal: bars that cover an entire mountain, dividing a village and its inhabitants, and that are escorted along their course by two military devices, one on each side. If from one side the environment is a reminiscence of World War I, with dug trenches and soldiers at every 20 meters, from the Spanish side it makes us think about a futuristic war. Typically, Moroccan action prevents European hands to fill with blood. Near Ceuta, in Morocco, there is the Beliunes forest, where until October 2005 over a thousand people waiting for the appropriate moment to cross the border had been camping. Generally, these camps are formed by communities with different backgrounds and are organized in assemblies. They are illegal or semi-illegal camps, which last until the Moroccan police, or the lack of supplies and the spread of diseases require them to dissolve. 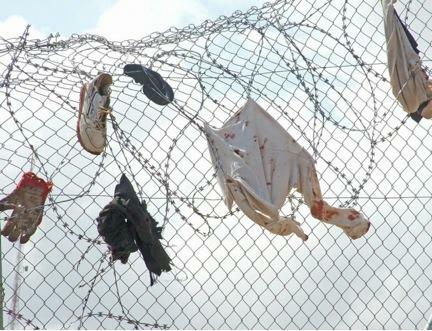 In these camps – among the most famous there are Beliunes grove in Ceuta, El Pilar de Rostrogordo and Gurugu mountain in Melilla – the situation of these illegal people is difficult and dangerous since, they are at the mercy of all kinds of abuse, not only by Spanish and Moroccan police, but also due to each other desperation, or the arbitrariness of speculators who take the opportunity to do business. Jumping off the grate implies a bit of organization: having stairs at least 6 meters long; paying attention to both the police, and be willing to die – and to see the bodies of the partners remaining behind – since, if the Civil Guard (the Spanish gendarmerie) electrifies the barbed wire and uses rubber bullets, the Moroccan army shoots real bullets and transports captured people in trucks into the desert. When an “illegal” manage to reach Ceuta, he has to go to the police station. There, he is recorded as having no papers, and it’s left to local authorities to decide what to do with him: it can vary between deportation and receiving a provisional document, which allows the individual to move into the European territory (without, however, having documents allowing him to sign an employment contract). At the door of the police stations, Civil Guard elements often prevent the immigrants to submit to the authorities, handing them to Moroccan militaries. If they got the provisional document, they are “deposited” in the CETI – Centre for Temporary Residence of Immigrants – a center for 450 people, which arrives to welcome 1700. The most of them come from countries marked by hunger, misery and war: Sudan, Ivory Coast, Nigeria, or Guinea-Bissau, as well as India and Pakistan. In the land around the center the environment is that of a tower of Babel where customs, cultures, and habits coexist in niches. However, even in Ceuta or Melilla, these people are faced with the racist hostility of the Arabs of North Africa, who do not consider themselves Africans and who think that “their” land is not for blacks; with police brutality, who does not hesitate to rip their refugee papers; or with the contempt of vendors, who refuse to sell them food. The migrations of people and the circulation of knowledge are part of the same process5, which is felt on both sides of the strait and increasingly requires rethinking the very notion of territory. The Spanish enclaves of Ceuta and Melilla, located in Moroccan territory, are exceptions in the frontier line that – if these enclaves did not exist – would follow the coastline.